One way that a new blogger can get story ideas and make a name for themselves is to report on new and interesting startups, the problem has been how do you find out about a startup early enough to get the scoop? The main service that I was aware of was KillerStartups.com, they saw the need, the niche, and acted with great success. The problem that appeared was the sheer amount of new startups interested in the publicity made it impossible for detailed coverage of any of them. The cookiecutter information that became the standard fare on KillerStartups, while still useful, left open a door for competition that could do a better job providing coverage. 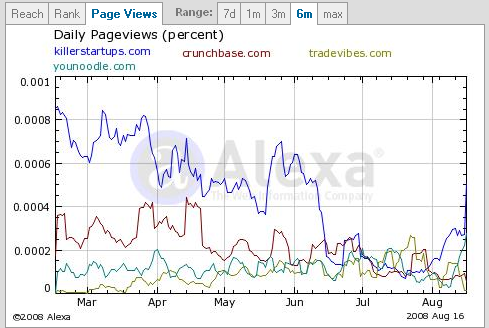 The Alexa data also seems to show some hope for KillerStartups, but the Google Trends data is showing a clear flatline. So, we get back to the title of this post, does the way KillerStartups delivers information still have a place? Can they bounce back or has KillerStartups been killed? (Disclosure for this post) TradeVibes “Be The VC” Winner is Me! *Update! – Please be sure to take a look at the comments and note that the Quantcast directly measured results back up what the Alexa results show, a significant bounce back up in traffic and a hefty lead in readership over Crunchbase.